A rich and velvet smooth body butter, which is an ideal product for nourishing and moisturising dry skin. The composition of the product is luxuriously soft and thick but made easy to spread on your skin by adding plant oils. This body butter contains almond oil that takes care of the skin and enhances its elasticity. Large amounts of shea butter soften and smooth the skin, while retaining its moisture efficiently. Coconut butter calms the skin and contains antioxidants which are vital to it. Jojoba wax smooths and softens the skin. Natural vitamin E, which is important to the skin, has also been added to the product. The scent of this body butter comes from essential oils of cypress and lemon. Essential oil of cypress carries a smoky, sweet balsam scent that lingers. Cypress oil nurtures, purifies, alleviates stress and relaxes. Organic essential oil of lemon has been proven to improve the mood. Lemon is also beneficial for circulation. Benzoin resin combines these two oils and balances the fragrance, while nurturing the skin. Once your skin has absorbed the body butter, the light scent fades. This product nurtures both the body and the mind. Body butter is absorbed best right after a wash, when the skin is still slightly moist. Take a small dab of body butter and spread it on clean skin with light circular motions. 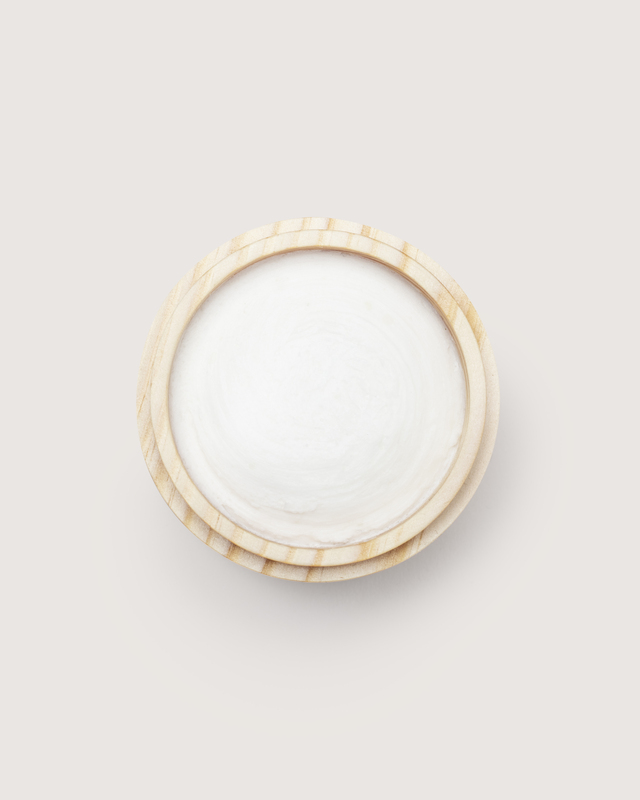 Shea butter adds richness while being an occlusive agent, which allows the lips to breathe. It contains plenty of vitamin A. Shea butter also helps the skin absorb other ingredients. In addition, it contains phytosterols which help stimulate cell formation. Almond oil makes the skin smooth and improves elasticity. It contains large amounts of vitamin E, which is essential to the skin. Almond oil is often suitable even for people with nut allergies, as it contains no proteins. Jojoba oil is similar to skin’s natural oils, which is why it is absorbed easily and fast. Jojoba oil helps balance out the natural oil levels of the skin. It balances out the richness of the product. Organic virgin oil. Due to the small molecular size of fatty acids, skin absorbs coconut oil fast, and it balances out the other vegetable oils contained in the product. Vitamin E is a strong antioxidant, which aids cellular respiration, protects the skin cells, and rejuvenates and firms the skin. Benzoin resin is a gently warming, subtly vanilla scented euphoric oil. Benzoin resin is effective in caring for the skin, it heals cuts, and can also be used to treat pigmentation. Benzoin resin has a relaxing and harmonizing effect, but it may also lift the spirits and invigorate the senses. A warm, woody and aromatic scent. Refreshes, improves concentration, rejuvenates and gives strength. Cypress accelerates the fluid draining process of the lymphatic system. Cypress oil also heals and stimulates blood circulation. Cypress is antiseptic and efficiently alleviates pain. The fresh and clean scent of lemon invigorates you and enhances productivity. Lemon is beneficial for digestion and circulation. It also aids itchy or irritated skin and can help combat cellulite.